Although it requires some work in the spring to plant the tubers and in the fall to dig them up, it is well worth the effort. 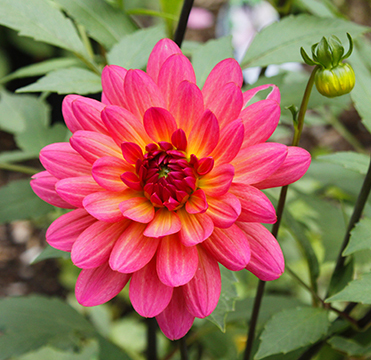 Dahlias are easy to grow when planted in full sun and well drained soil. They provide copious blooms for cutting and are available in many flower types, sizes and colors. I attach wide duct tape around the base of each plant in late fall in order to write the dahlia’s name with marker to identify each tuber. This is extremely helpful when spring planting time arrives. Once we have our first hard frost the foliage dies back and it’s time to cut it off, knock the dirt off the tubers and allow them to dry for a week or two. Then they are put into paper bags and kept in a cool, dark corner of the basement for the winter.